Set in the small town of Pontypool, Ontario, radio host Grant Mazzy (Stephen McHattie) drives through blizzard-like conditions to work and on the way has an odd encounter with a woman who repeats muffled sounds over and over. When he reaches his radio broadcasting station, he is joined by the station manager, Sydney Briar (Lisa Houle) and the technical assistant, Laurel-Ann Drummond (Georgina Reilly) before going about his day-to-day activities. After an average, less-than-noteworthy few hours of news, Grant receives information from the station’s helicopter reporter, Ken Loney (Rick Roberts) that an apparently violent mob has infiltrated the office of one of the town’s doctors. From then on, it becomes apparent to Grant and the others that something is not quite right with the ‘mob’ in question, and the radio employees’ situation quickly becomes one of doubt, fear and worry. Originally screened at the Toronto International Film Festival in 2008, Pontypool is a completely different take on the zombie/post-apocalyptic genre. Whereas the focus of such films tend to be on gore and exhilarating action, Pontypool certainly is exhilarating, but far more in the psychological sense than in anything to do with flying body parts. The first thing to say about this film is that it is set, for the most part, in one location — the radio station — which benefits the film hugely. Director Bruce McDonald could very well have taken his cameras to various locations and opted for visual scares, but instead he centres the slow building and uneasy atmosphere on dialogue alone. Having the film play out in one location, and through the eyes of the three characters in the radio station, also places the viewer in the station with the characters — as opposed to he/she being repeatedly removed from film due to it jumping all over the place. Having shot the film in a single location, McDonald is able to fully develop his main characters and show off their every emotion while they receive word about various horrible events taking place elsewhere in the town. Stephen McHattie pulls out an over-the-top, yet thoroughly entertaining performance as a tiring radio presenter who seems to irritate more than anything else. The over-the-top element of McHattie’s performance ensures that the film does not slip completely into a downbeat, hopeless realm and even gives Pontypool a slightly humorous tone at times. His somewhat distant nature at the beginning quickly unravels as the situation dawns on McHattie and his colleagues. Lisa Houle is decent in her portrayal of a considerably controlling station manager. Her character grows as the plot develops, and for her first film role (she is married to McHattie, I wonder how she got this gig?) she puts in a solid effort which is sometimes let down by her less-than-believable attempts at displaying grief. Each of the supporting actors step up to the plate when called to do so meaning there really is no weak link in the cast. I am not entirely sure what McDonald had in mind when he was making Pontypool, in terms of what he wanted audiences to take from it, but I would love to know. For me, it is clearly a film about how we, as society and as individuals, are so wound up and led on by dialogue — regardless of who or what the source is. The film evokes connotations about how governments rule us and how the influence, and existence, of a global media order thrives on our reaction and acceptance of what they tell us. Throughout the film, our lead characters are relentlessly relayed news and it is their reaction to each snippet of news (one of acceptance over ignorance) that the film is built on — their lack of dismissal means the viewer goes on a journey of weariness, anxiety and fright alongside the radio trio. For all the viewer and characters know, the information they are receiving could be a hoax — again, the ploy by McDonald to keep the focus of the film in one location is essential here — but without seeing what is going on externally, they (and we) end up putting faith in unfounded knowledge. Sounds vaguely familiar, right? In terms of logistics: visually, at a budget of around one and half million dollars, Pontypool looks great and includes some neat gory, non-CG effects. I noted a few paragraphs prior that the film chooses atmosphere over gore for scares, but what is a zombie film without a few zombies and some blood and guts? Pontypool is far from loaded with the aforementioned though, which is a good thing because it certainly would have been easy for McDonald to set the film off in a clichéd zombie-fest direction during the last thirty minutes or so, but his avoidance to do so benefits the overall product greatly. The script is well written and smooth, particularly in the first half of the film where words are the primary purveyor of scares. The lack of drag (not that kind) during the film is a testament to the writers’ ability to keep their writing slick and interesting. Just like in my Star Trek Into Darkness review, I am going to avoid giving away too much here (I reckon I should just get rid of the whole spoiler thing anyway, it is slightly disrespectful to the film industry I think), however I will say that the ending worked for me. I have no idea what was going on during the post-credits scene though, somebody will need to fill me in on that one. 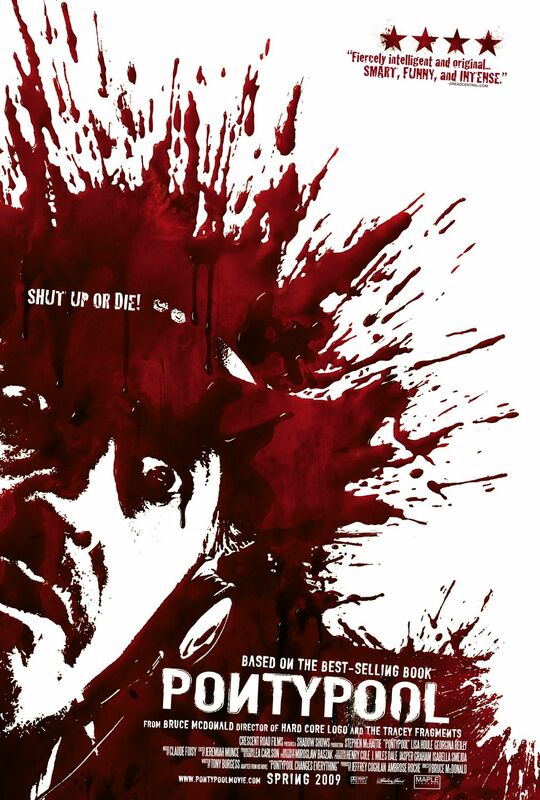 Pontypool is a unique film in that it successfully combines the zombie genre with psychological horror, offering up a thought-provoking and generally gripping thriller in the process.